An Excel 2019 School Calendar template is something that a teacher can use to keep track of important activities and dates throughout the year. A calendar is something that can be printed out for each year, and this can allow a teacher to have a system to help them stay on track. Many teachers have a very busy schedule, and a calendar can be the perfect tool to help them keep track of all of the minor details. A calendar can allow a teacher to write things down on this calendar and then refer to this calendar for future reference. Anytime a teacher needs to schedule something on a specific date, they can easily access this calendar and write it down to help ensure that they do not forget. A great deal of information about students can be recorded on a 2019 School Calendar template and this can help a teacher that is running a busy classroom. A teacher can print a calendar for each school year, and this is something that can help a teacher every year they are in the classroom. If a teacher makes a habit of using the calendar on a regular basis, it can help them to really use the calendar to the fullest. This can be a great habit to make while the in the actual school year. 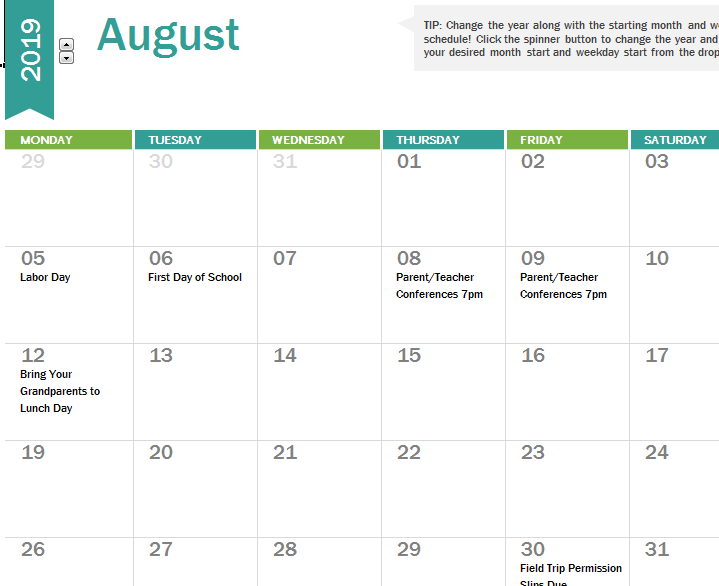 As a teacher gets new information about important dates before the school year starts they can begin filling out this calendar to provide a great, and organized start to the year. If a mistake is made on this calendar it can be very easy to correct. There is no fee for printing out a 2019 School Calendar, and if mistakes are made they can be easily changed. A 2019 School Calendar can be the perfect template to help a teacher stay organized. This is something that can be used for every academic year.